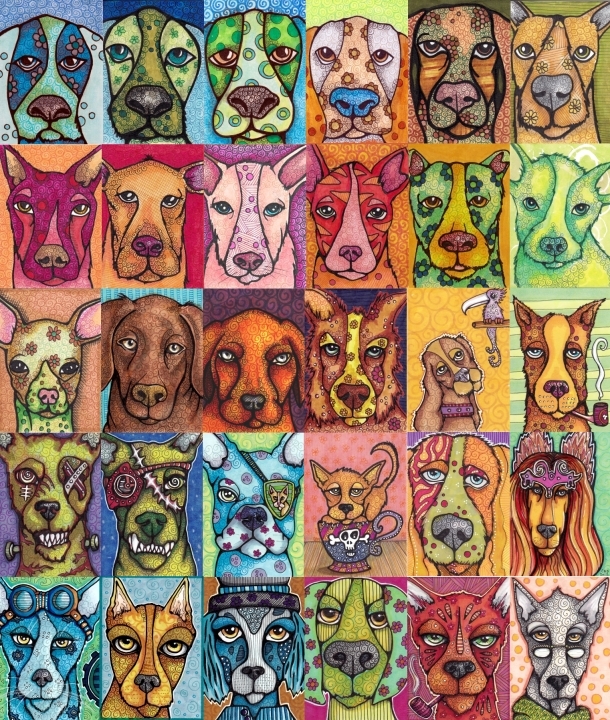 So I had this idea, because I love dogs and I love collections of things, to do a poster with 30 of my art card dogs, which I’ve been enjoying very much lately! I’m also planning to add either a booklet with short stories, or some other supplementary type material to go with the poster. This page will be updated periodically with the most current drafts on top, and horizontal lines between entries. Thanks for having a peek! It may soon have its own site, depending where it goes. All art and text on this website copyright Cindy Dauer. No stealing please! I have finally ordered the first one! 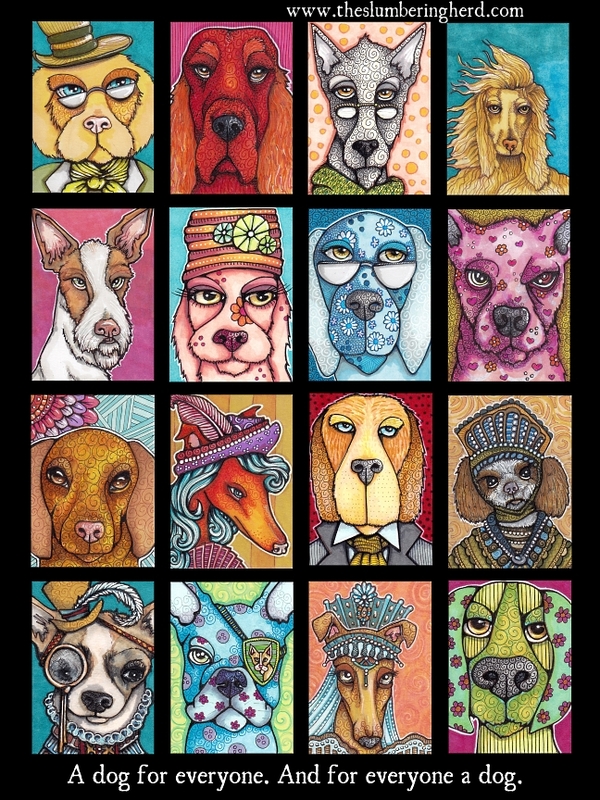 It includes 20 of my favorite art card dogs and is 16″ x 20″. See below. Though I hope to find a local printer, I have ordered this one from an online printer. I chose a white background but may do both black and white. Holy cow, has time passed! 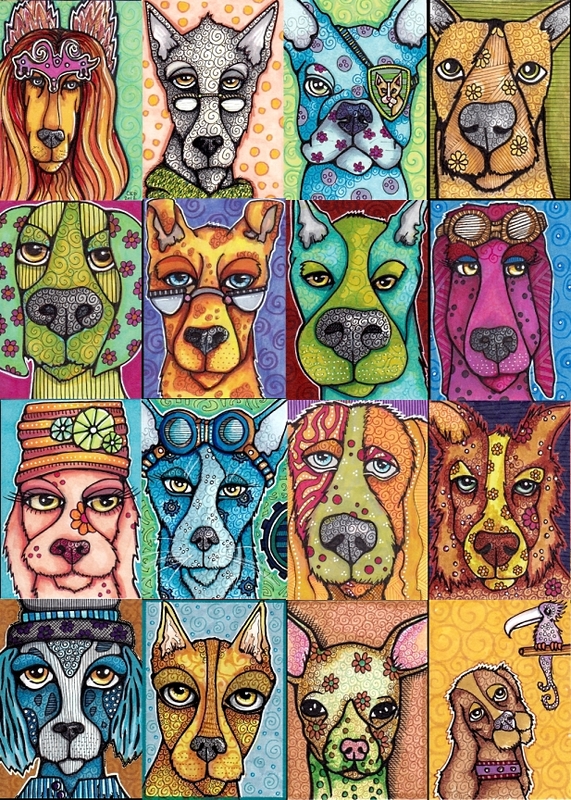 I have not forgotten about the Art Card Dogs Project! Oh no I did not. 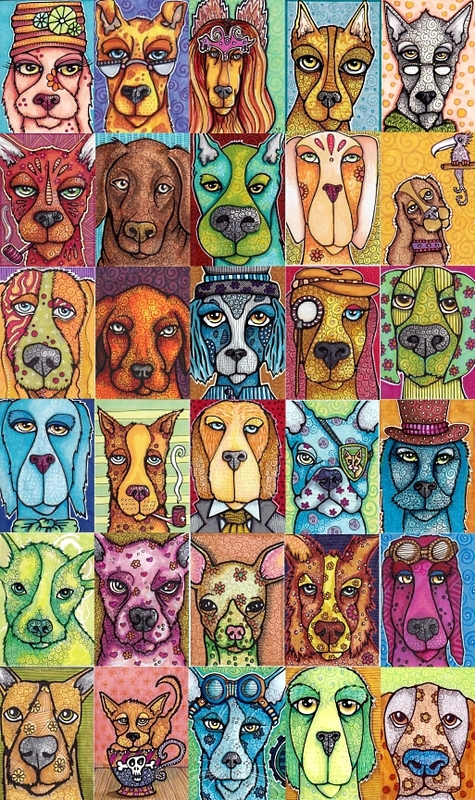 After several months of drawing fancy dogs in fancy clothes and adding them to my other dog cards, I ended up with quite a diverse group of canines. A dog for everyone. And for everyone a dog. This version has a goofy assortment of semi-realistic, bookish, terribly fancy, regal, dainty, serious and tough. A dog for every personality! Which is where the text came from. I’ve probably heard it somewhere before. I should probably check. Three new dogs. Hooray! Pete already made it onto the latest draft (below), but Simon and Nellie are probably going to kick two others off. Simon is director of a thriving community garden. As a puppy he was forced to work in the garden after being caught destroying pumpkin plants (on a foolish dare). In a surprising turn of events (particularly to his mother) he soon became the most skilled and involved plant tender. Three years later he took over after Marius the previous director retired. Nellie is a crafty sort who likes to knit hats. When not making hats, she watches reruns of Project Runway. Sometimes all day! I put 30 dogs together! Still needs rearranging though I tried not to put two similar ones next to each other, with some success. Replaced 11 of the earliest dogs from the first version on January 27! Includes 4 hats, 2 pipes, 2 pairs aviator goggles, 2 pairs spectacles, one monocle, one eyepatch, one crown, one ascot, one cravat, one teacup, one bird. I think I may do a few more with spectacles, maybe pipes, maybe ascots, and do a print of “intellectual” canines. Each 2.5″ x 3.5″ art cards, pen and ink with Copic markers. In addition to the poster, I am considering either a small accompanying booklet with each of their (very short) stories. Or possibly a kind of serially-updated App where I write a story featuring each dog with each other dog (though that would clearly be way too many stories. So many may include larger groups of dogs.) I would try to write the first 10 stories, and release the first five as a pack and then some ongoing schedule of releases. Any thoughts? Feel free to share in the comments! Thanks for reading! I love it so much!!! I wouldn’t mind the zombie dogs, they are very interesting and different!!! Such a good idea. 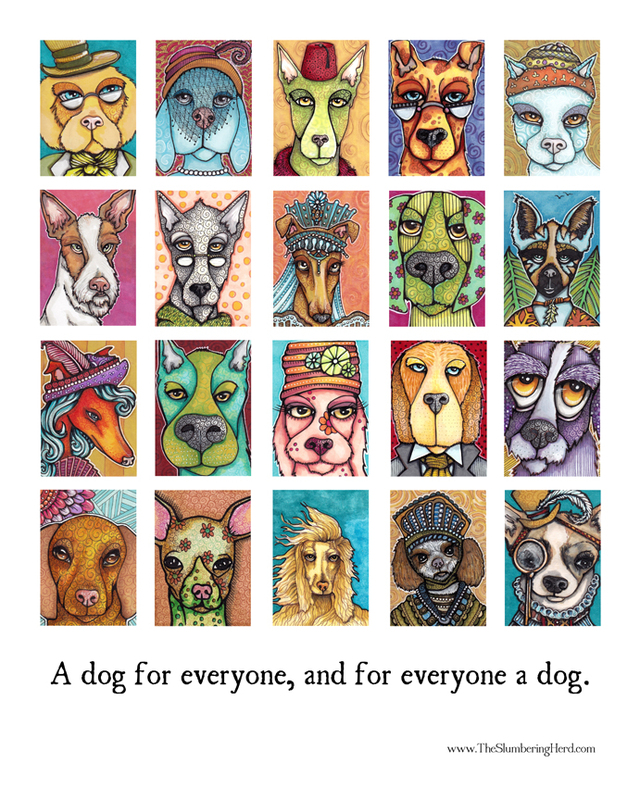 I definately think you should do a book with the story of each dog alongside his/her picture. What about a series of booklets like a zine, or even in pdf format to start with, as you already have the stories and pics, and you could then do specials on say zombie dogs etc. This will get you started and give you time for larger groups of dog stories. I think you could do this with any of your animals, as they all have such cracking stories and are great visually. So much for you to think about and exciting as well! You’ll soon have to give up the day job! I like this. I like the idea of little books with their stories too. My only suggestion is that you should line up the dogs so that they will end up in a standard size frame. Good luck with it! Excellent point about the standard size frame! While I like them all! My particular favs are on the bottom row! They have such personality! I def like the short story idea! Can’t wait to see what you come up with! Terrific idea Cindy-both the poster and the short stories. Oh, wouldn’t remove those wonderful zombies! Fun idea, Cindy! Love how colorful it is! I think my favorite is the very last dog for his distinct personality! Specials for zombie dogs is a great idea! Oh, yes, this is getting to the book I have been wanting to see! Your stories must be heard as your art must be seen. Somehow I missed seeing the very last dog before-the grgadfather or professor, whatever the case may be. He is excellent! I love the booklet idea! I can totally see this developing into a children’s book about dogs. You can try a publishing it in Kindle first (cheaper?). They are truly awesome……I love every one of them……each w its own unique personality. My favorite is the chihuahua (because I have 2 of them!). What an awesome project! I really enjoy the different combinations you are coming up with! I look forward to seeing more of this project. By the way, thank you for your kind words on my blog! Just found your Art Card Dogs Project! Very creative idea and such lovable dogs too! Ich würde sehr gerne deine 30 Hunde auf Stoff drucken lassen. Daraus möchte gerne deckrl für meine messenden bags nähen. Ich würde dich natürlich als Künstlerin erwähnen und verlinken. You need to sell this to a fabric house! I would love fabric to work with. Beautiful job! Hi. Wow. I love your dogs! Really really sweet. I love the juxtaposition of the styles and colours and I find the 4 images by 4 to be the most powerful layout. It gives me a sense of many, while allowing me to take them all in. The 6×6 is too much.